Native to India, the small, beautiful gold-green mung bean is one of my favorite beans to cook with. Although Indian cooks most often cook with split mungs, I particularly enjoy cooking with them whole in a dry texture finish so that the plumb and tender legumes stand out by themselves — besides, they take hardly any longer to cook than the split ones, especially if you soak them ahead of time. Serve this simple but incredibly flavorful curry with vegetables, an Indian rice dish such as simple pulao rice or piquant lemon rice and an Indian flatbread for a complete and satisfying meal. You may also wish to try one of my all time favorite mung bean recipes: mung beans with paneer cheese. It is a flavorful combination of buttery-soft and sweet mung beans, golden-brown fried paneer cheese, tomatoes and spices — a wonderful dish to serve to your dinner guests. Rinse the mung beans under cold running water and place in a bowl. Cover with several inches of cold water and soak for 6 hours or overnight. Drain, rinse, and set aside. Heat the ghee or butter and oil in a large saucepan over medium heat. Add the cumin seeds, and stir and fry for a minute or two. Next add the ground spices, stir for about 15 seconds, and then add the onion, ginger and jalapeños or green chillies to the pan. Fry until the onion wilts and begins to brown. Add the mung beans and and 1 1/2 cups of water to the pan. Bring to a boil, immediately reduce the heat and simmer, partially covered until the beans are just tender, about 20 to 30 minutes. Add more water if necessary just to keep the beans covered. Now add the tomato, salt and pepper. Simmer for another 15 to 20 minutes or until the beans are soft and the liquid is mostly absorbed. Taste for seasoning, then stir in the parsley near the end of the cooking time. Serve hot with fresh cooked rice or Indian flatbreads. I love dhal and am always looking for new ways to prepare it. Thank you! What a beautiful photo, it instantly tempted me! This dish really worked out well! I was especially pleased, as I created the recipe from scratch. To clarify, I make virtually every recipe from scratch, but I created this dish without the aid of a recipe. Hey, I was looking for new mung bean recipes to try. This one's the winner for tonight! Glad to be of assistance Sunni. I'll be posting more mung bean recipes in the future. Made it today - loved it! Not over-spicy, which is usually my concern with Indian food, - even though I added twice as much coriander by accident. It went well with quinoa. This came out well. I did add some garlic when I added the ginger and onion, and I decreased the amount of ghee. Very nice recipe, and excellent website. Thanks. Made this tonight with quinoa/oats as the grain and Sauteed Cauliflower & Green Peas from "Lord Krisha's Cuisine" for a veg dish - excellent! Turned out almost as amazing as my Indian friend makes it. The beans need lots of heat for a long time. So while I religiously cook at about medium, this recipe required medium-high. Yummy! I just made your pulao rice, which can accompany the moong dal. The rice is great. Thank you. Have to wait to make the moong dal, I'm out of cumin seeds, live out in the sticks,have to go to city. Gonna try the other moong and split moong dish soon. Funny, a local Thai grocery here has both dals, but practically no spices. could you clarify how much ghee to add? it says add 1/4 ghee but no measurement. really excited about this recipe!!! I have fixed my error. Thanks for pointing it out to me. Sometimes I just type too fast and make a few typos. Hi Lisa! Thanks - and HOLY COW was this tasty!! We made in combo with your Pulao Rice recipe, with a little Mango Chutney and baked Acorn Squash w/brown sugar on the side ... still in mung bean heaven!! Just SO glad I found your blog - have been wanting to find my way into Indian dishes and you're the jackpot! Five stars and then some for these recipes! The meal is beautiful to look at and inspired the comment "YOU made THIS? You MADE this? Not bought this, YOU MADE THIS??????" That's great! I am so glad you enjoyed your meal. Thanks for visiting and trying some of my recipes. Hi Lisa, I found these beans which was totally unfirmalier to me at our Spar. Googled some recipes and boy was I glad I picked yours!! Tonight is the second time as the kids just love it. Thank you so much. I am so delighted you enjoyed this dish. Thanks for letting me know it was a hit with your family. I accidentally added 2 teaspoons of cayenne pepper instead of 1/2 teaspoon. I thought it said 1 - 2. Oops, I hope this won't affect it, I like spicy. I'll let you know how it comes out!! Do let me know how it turns out :) I like spicy too and I bet I could handle that much cayenne! Thanks Bob. Always appreciate it when folks make my recipes and it is one of my favorites for sure. First time using mung beans and I used this recipe, it was lovely I will definitely be having them again and using this recipe, thanks Lisa. like many others on this blog, I also came by these beans by chance and only bought them cos' they were heavily discounted and I thought I'd always fine some recipe on the net. I picked Lisa's for I had all the ingredients readily available in the house and like most of you I am glad I did. On a different note, on another occasion I cooked these beans I had some spinach in the fridge which needed used, so I threw it in, added little more water than indicated in the recipe and it turned out Dahl style but it retain the good taste. picked Lisa's simply because I had all her recipes ingredients readily available in my kitchen and I've cooked it many time since ! Thanks for your comment. If you are using the split version of mung, you won't need to soak them ahead of time. Very nice and tempting Mung dal recipe, this mung dal is my favourite. I came across mung dal in a local shop recently. Can you confirm if mung dal is split mung bean? 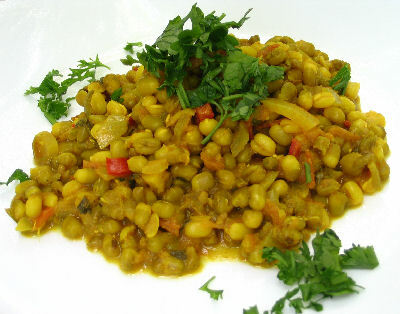 For this recipe I used whole mung beans rather than the split dal. Can you put in garlic too? I followed this almost 100% and my husband who is Punjabi native, was actually blown away by how good and how authentic this recipe is! I have Turner’s on my mum’s side of the family. Perhaps we’re cousins, Lisa lol. Thanks for the fantastic recipe and remember Do Not use garlic or lemon with this recipe as it will ruin the flavor of the bean. Your recipe is perfect, spot on , congratulations on a fantastic dish! You could add a wee bit of garlic and a splash of lemon juice. A small amount would not spoil the dish.